The success of the Go Pro action camera revolves largely around one man’s dream, the device’s inventor and current CEO of the GoPro, Inc. Company, Nick Woodman. In the late 1990s – early 2000s, Woodman, a California native and passionate surfer, came up with the idea of an affordable camera attached to the wrist. It would allow amateur users to take professional-looking action pictures, while leaving them the freedom to ride waves. After having raised funds by selling beads out of his car and receiving a generous investment from his parents, the young inventor proceeded to launching the first GoPro camera, which used 35 mm film, in 2004. Woodman started promoting his product, called GoPro 35mm Hero, directly to tradeshows and surf shops on the West Coast. In 2006, as digital cameras were becoming more and more popular and their technology increasingly affordable, the company (then still known as Woodman Labs, Inc) launched its first Digital Hero, a camera capable of recording video as well. According to Forbes, the small company, which only had two other employees aside from Woodman, managed to raise the revenue level to 800 thousand U.S. dollars in 2006 and some 3.4 million U.S. dollars the following year. Following its success, GoPro kept on improving its line of mountable and wearable cameras, which the company refers to as capture devices, by adding the HERO2, HERO3, HERO3+ HERO4 and HERO5 cameras. Once HD technology became readily available and consumer demand for better quality images increased, GoPro moved on to launch a series of HD HEROs, boasting options such as wireless access to the internet, image sensors and increased internal memory. In addition to its capture devices, the company also manufactures a range of accessories enabling users to film in any conditions, such as chest harnesses and head straps, and from any surface, as mounts for helmets and handlebars. Furthermore, GoPro has developed two software applications: GoPro Studio, a video editing tool helping users to create videos from their GoPro footage, and the GoPro App, which enables users to remotely control their GoPro capture device using a smartphone or tablet. A YouTube channel posts content filmed with GoPro products, in order to promote them and the company’s lifestyle brand. 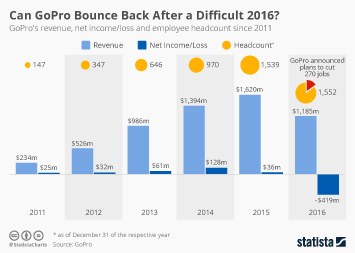 In 2016, GoPro reported worldwide revenues of over 1.19 billion U.S. dollars, with the majority resulting from sales from the Americas region. More interesting topics from the industry "Cameras & Video Equipment"